Two Months Until Cataclysm — So Now What? I’m sure that having a concrete date two months away is going to make some folks angsty. After all, if you don’t have an army of alts and killed the Lich King months ago and have already been feeling like you were stuck in a holding pattern, I can see how it would seem like way too long to wait. Had I not rediscovered the joys of playing my Alliance characters, I would likely be in the cursing the release date under my breath camp. So, now that we have a date in hand, what’s your plan of attack? My priorities on my main are to finish Over 9000, farm up potentially missing rare pets, and finish up reps that might be disappearing, esp. ZG and ThoBro. A lot of other things depends a lot on if I have to move servers. :-/ I had just gotten my balanced alt army of professions settled again with the transfer of my miner to my main server. So if I’m not going to be moving my alts pre-cata, leveling a DK with skinning/mining for my main’s crafting professions tops the must-do list. Also spend some fun times learning how to tank, and leveling my alliance alt. I need to do some thinking about reps I want to finish on my druid as well. I kept putting off the Sporregar, but as a serious pet collector, she really should have the sporebat. Totally agree that DKs are a must-roll for any server transfer/re-roll. I can’t believe how quickly mine helped me ease back into Alliance life with a nice little bit of starter cash. Good luck with the prospective guild raid Vent sit-in tonight! Sporregar is not bad as a druid, stealth runs of underbog are fast and zippy. I’ve never managed to get a DK out of the starter zone, I just don’t get the playstyle at all. Spam buttan harder deathgrip steal a tiny pony /fizzle. (Which is weird since I love playing melee with self heals, locks ret and ehn are my favorite leveling specs.) I’d also need to decide how much gold I wanted to transfer, I’m way over the cap + have almost no free bag spaces after bound gear. Hehe I also prioritize vanity pet or mount rewarding reputation grinds. 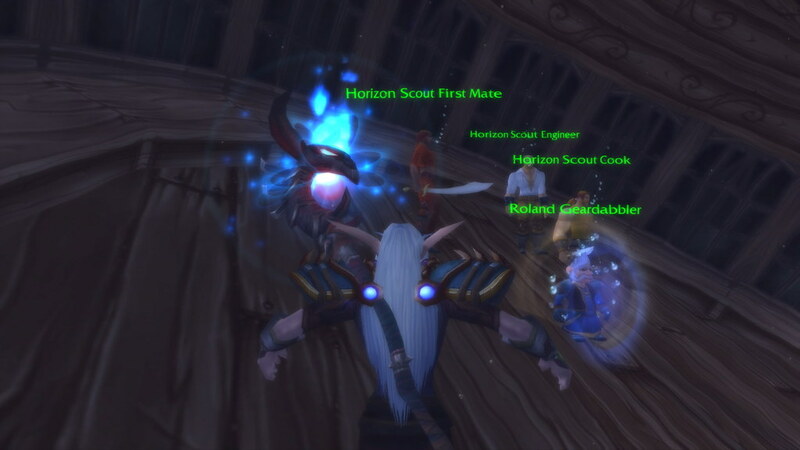 This is why several of my Alliance toons have spacegoats. I thought ZG would be here until whatever the pre-Cataclysm event is that tears the world apart, i.e. somewhat before Cata but not necessarily with 4.0, but that could be totally wrong. I’m working on some old TBC reputations like Netherwing and the Skyguard for mounts, and trying to farm up the rarer pets like the Whelplings. Maybe, after I get those, I’ll continue to work on the Chef and Salty titles. Plus I need to grind up my Cenarion Expedition reputation on my druid, so that she can get the Guardian of Cenarius title.